Many thanks for the support to swedeken und den Hersteller Enermax. 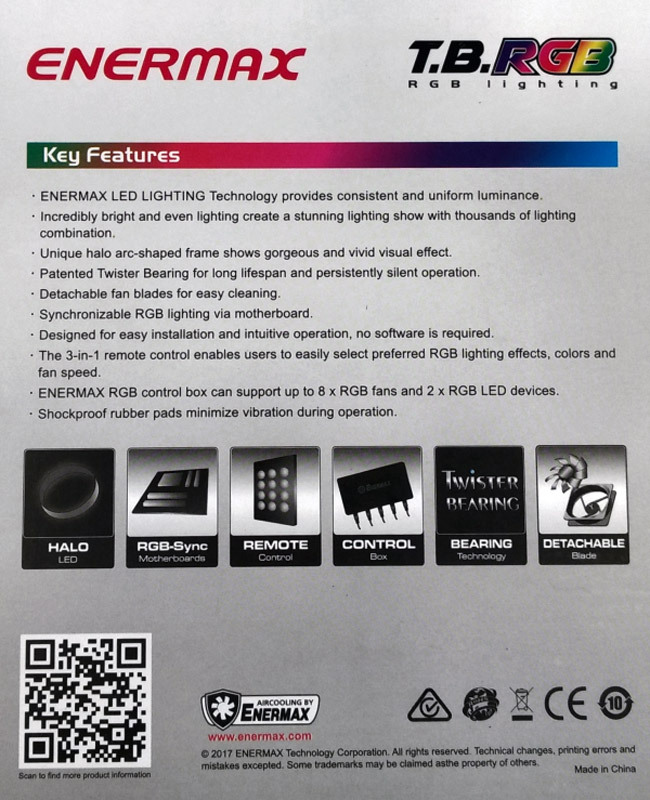 Enermax has kindly provided us with a T.B. RGB 3 Fan Pack sample. The Enermax T.B. RGB 12cm 3er Pack with controller and remote control UCTBRGB12-BP3 has a price of 49 Euro at the time of testing. A T.B. RGB 6er Pack UCTBRGB12-BP6 is about 75 Euro and a single T.B. RGB 12cm fan UCTBRGB12-SG currently has a price of approx. 17 Euro (11/2018). 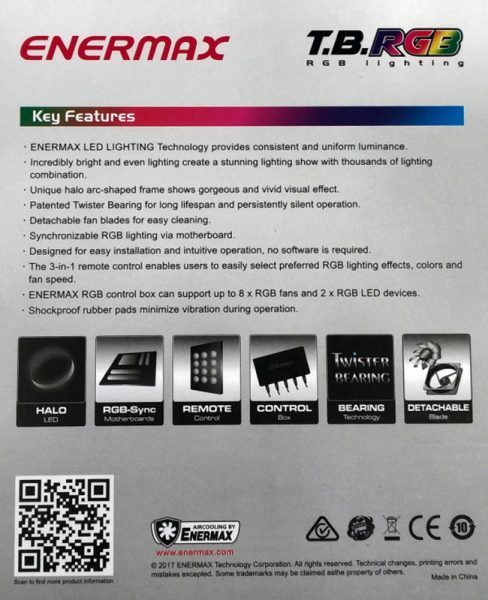 Here you can buy the Enermax T.B. 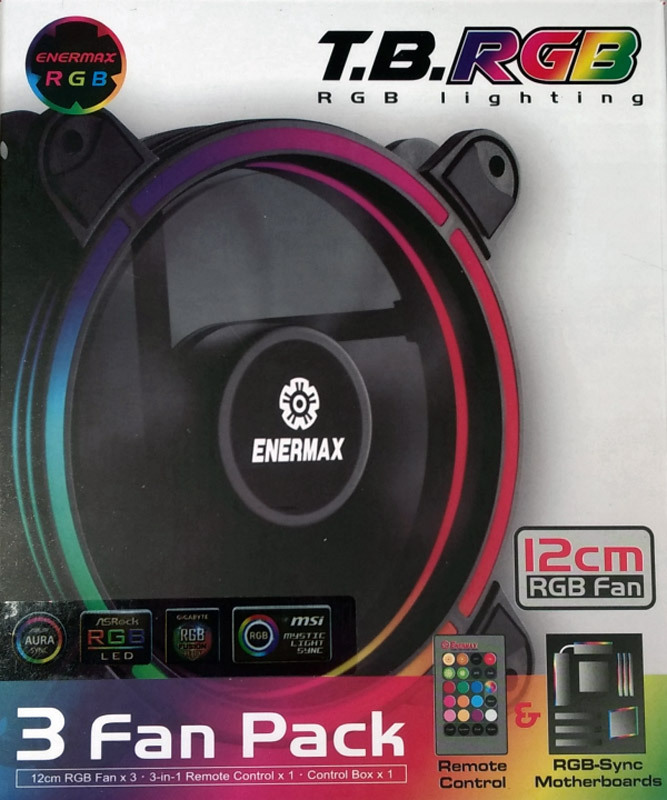 RGB 3 Fan Pack (UCTBRGB12-BP3). The box already contains the contents of the packaging, the most important technical data and special features of the fans. The controller can drive up to 8 T.B. RGB fans. 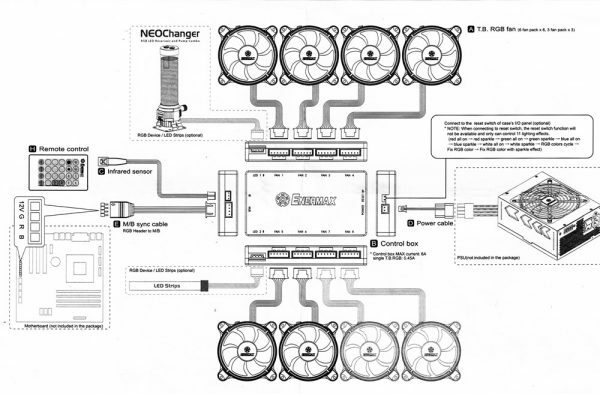 There is therefore also a 6 fan pack, but the 12cm RGB fans can also be purchased separately. The well designed packaging is compact. The three RGB fans are packed separately in cardboard boxes for protection. Another small box contains the controller unit, the remote control and other accessories. It’s amazing what’s inside the small box. The User’s Manual is a clearly laid out A4 note with space for all important specifications, the parts list, a description of the remote control functions and a comprehensive exploded view for easy installation. Unfortunately the manual does not contain any information on how best to remove the removable rotor without running the risk of damaging it. How to do this is explained here in the review.